Pelican Paradise is a place for couples ,families, or friends to relax and recharge for a short or extended stay located on the shores of Little Lake Reserve. With its own private entrance on the ground floor. 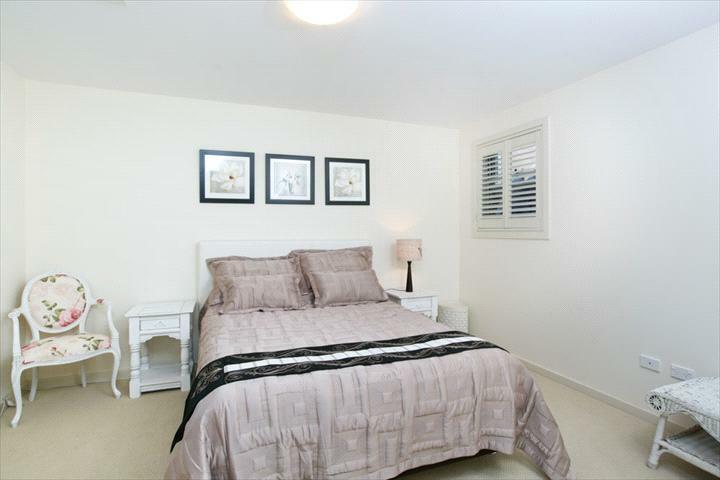 This very large self contained 7 room apartment containing 2 bedrooms both queen beds. Bathroom has bath and separate shower also separate toilet large lounge/ dining has TV DVD player and library for guests entertainment. The family room flows on to fully equipped kitchen .Complimented by a butlers pantry contains fridge automatic washing machine microwave and dishwasher. The kitchen flows into the bespoke back garden with gazebo and other seating areas flood light at night. An ideal stay for couples to relax and recharge with the option of a second bedroom if required for family or friends. Situated across the road is Little Lake complete with covered barbecue area. A 2 minute walk to the sandy stretches of Warilla Beach and enjoy the shared pathway/cycleways along the ocean foreshores and onto the entrance to Lake Illawarra. An outdoor shower when coming from the beach to complete for the perfect stay. Relax & unwind in a fully equipped executive apartment with 2 Queen luxury rooms, large lounge/dining and full size bathroom with separate shower, separate toilet, fully equipped kitchen with separate butlers pantry. The owners occupy the upstairs of the house with the accommodation having its own private entrance opens onto a gorgeous garden complete with vine covered French gazebo which is wow!!! Or you can relax & unwind in the ion the garden lounges read a book. Continental breakfast/starter pack included! Centrally located in the heart of the Illawarra where you can explore Shellharbour and the surrounding areas including sandy beaches & lake foreshores, cycleways/walking paths, rainforests & waterfalls, wineries, markets, museums, clubs, restaurants, boutique shops & cafes. Also close proximity to Kiama & the Southern Highlands. Call any time for further information. 2 bedroom self contained unit both rooms with queen beds, separate entrance, kitchenette, large lounge/dining room, with a private courtyard & BBQ. Continental breakfast included. Free Wi-Fi Available. For cancellations14 days prior to arrival date No refund applies unless the booking is reallocated. 28 days cancellation will incur a 50% refund. 6 week cancellarions will be charged a 20% fee of the total booking. Extenuating curcumstances will be assessed by the owner on its merit.